"The Voice of the National Weather Service"
NOAA Weather Radio (NWR; also known as NOAA Weather Radio All Hazards) is an automated 24-hour network of VHF FM weather radio stations in the United States that broadcast weather information directly from a nearby National Weather Service office. The routine programming cycle includes local or regional weather forecasts, synopsis, climate summaries, synopsis or zone/lake/coastal waters forecasts (when applicable). During severe conditions the cycle is shortened into: hazardous weather outlooks, short-term forecasts, special weather statements or tropical weather summaries (the first two aren't normally broadcast in most offices). It occasionally broadcasts other non-weather related events such as national security statements, natural disaster information, environmental and public safety statements (such as an AMBER Alert) sourced from the Federal Communications Commission's (FCC) Emergency Alert System. NOAA Weather Radio uses automated broadcast technology (since 2016: Broadcast Message Handler) that allows (and frees NWS staff as well) for the recycling of segments featured in one broadcast cycle seamlessly into another and more regular updating of segments to each of the transmitters. It also speeds up the warning transmitting process. Weather radios are widely sold online and in retail stores that specialize in consumer electronics in Canada and the United States. Additionally, they are readily available in many supermarkets and drugstores located in the southern and midwestern US, which are particularly susceptible to severe weather—large portions of these regions are commonly referred to as "Tornado Alley". The price of a consumer-grade weather radio varies depending on the model and its extra features. The United States Weather Bureau first began broadcasting marine weather information in Chicago and New York City on two VHF radio stations in 1960 as an experiment. Proving to be successful, the broadcasts expanded to serve the general public in coastal regions in the 1960s and early 1970s. The U.S. Weather Bureau adopted its current name, National Weather Service (NWS), and was operating 29 VHF-FM weather-radio transmitters under the National Oceanic and Atmospheric Administration (NOAA) in 1970. The service was designed with boaters, fishermen, travelers and more in mind, allowing a listener to receive quickly a "life-saving" alert from the National Weather Office, and constantly updated forecasts and other climatogical data in a condensed format at any time of the day. This allows listeners get the latest weather when they need it, and more lead-time to prepare during severe conditions. In 1974, NOAA Weather Radio (NWR), as it was now called, reached about 44 percent of the U.S. population over 66 nationwide transmitters. NWR grew to over 300 stations by the late 1970s. Local NWS staff were the voices heard on NWR stations from its inception until the late 1990s when "Paul" was introduced. The messages were recorded on tape, and later by digital means, then placed in the broadcast cycle. This technology limited the programming variability and locked it into a repetitive sequential order. It also slowed down the speed of warning messages when severe weather happened, because each NWS office could have up to eight transmitters. "Paul" was a computerized voice using the DECtalk text-to-speech system. "Paul's" voice was dissatisfactory and difficult to understand; thus "Craig", "Tom," "Donna" and later "Javier" were introduced in 2002 using the Speechify text-to-speech system. A completely new voice was introduced in 2016 and implemented nationwide by late in the year. Live human voices are still used occasionally for weekly tests of the Specific Area Message Encoding (SAME) and 1050 Hz tone alerting systems, station IDs, and in the event of system failure or computer upgrades. They will also be used on some stations for updates on the time and radio frequency. In the 1990s, the National Weather Service adopted plans to implement SAME technology nationwide; the roll-out moved slowly until 1995 when the U.S. government provided the budget needed to develop the SAME technology across the entire radio network. Nationwide implementation occurred in 1997 when the Federal Communications Commission (FCC) adopted the SAME standard as part of its new Emergency Alert System (EAS). NOAA Weather Radio public alerting expanded from weather only to "all hazards" being broadcast. NWR grew to over 800 radio stations by the end of 2001. As of January 2014, there were 1032 stations covering approximately 97% of the United States, Puerto Rico, the U.S. Virgin Islands, American Samoa, Guam and the Northern Mariana Islands. As of January 2015, there were about 1025 stations in operation, with 95% effective coverage. In the wake of the 1965 Palm Sunday tornado outbreak, one of the key recommendations from the U.S. Weather Bureau's storm survey team, was the establishment of a nationwide radio network that could be used to broadcast weather warnings to the general public, hospitals, key institutions, news media, schools, and the public safety community. Starting in 1966, the Environmental Science Services Administration (ESSA) started a nationwide program known as "ESSA VHF Weather Radio Network." In the early 1970s, this was changed to NOAA Weather Radio. The service was expanded to coastal locations during the 1970s in the wake of Hurricane Camille based upon recommendations made by the Department of Commerce after the storm in September 1969. In 1970, 162.400 MHz was added as a primary channel. In 1975 Honolulu NWR station KBA99 was moved from 169.075 MHz to 162.550 MHz, at the same time 162.475 MHz frequency was introduced for NWR transmission (after several years of being limited only to special cases at 300 Watts to avoid channel interference). Many (if not most) basic weather band receivers manufactured and sold from the mid-1970s through the mid-1990s were configured to only receive these three "main" weather channels. However, some included four additional "intermediate" channels (162.425, 162.450, 162.500, and 162.525 MHz) which would accommodate anticipated expansion but went mostly unused during that time. Since then, a proliferation of stations have been installed and activated to ensure near-complete geographical coverage and "weather-readiness", many of which have been funded by state emergency management agencies in cooperation with the NOAA to expand the network, or state public broadcasting networks. To avoid interference and allow for more specific are coverage, the channel count has gone from three to seven. By April 1985, the NWS operated "about 392 stations" with "approximately 90 percent of the nation's population ... within listening range"; As of January 2015, the figure was "1025 stations" with a goal to "increase coverage to at least 95 percent". The NOAA radio network is provided as a public service by the National Oceanic and Atmospheric Administration. By the end of 2014, NWR had about 1025 transmitters serving 95% of the United States' population, covering all U.S. states, adjacent coastal waters, and the territories of Puerto Rico, the U.S. Virgin Islands, Guam, American Samoa and Saipan. NOAA also provides secondary weather information, usually limited to marine storm warnings for sea vessels navigating the Atlantic and Pacific Oceans, to HF band "time stations" WWV and WWVH—these shortwave radio stations continuously broadcast time signals and disseminate the "official" U.S. Government time, and are operated by the Department of Commerce's National Institute of Standards and Technology. The radio service transmits weather and marine forecasts (where applicable) and other related information, without any interruptions. In addition, NWR works in cooperation with the FCC's Emergency Alert System (EAS), providing comprehensive severe weather alerts and civil emergency information. In conjunction with federal, state and local emergency managers and other public officials, NWR has the ability to broadcast alerts and post-event information for all types of hazards, including natural (such as earthquakes or avalanches), man-made (such as chemical releases or oil spills), technological (such as nuclear power plant emergencies) and other public safety (such as "AMBER alerts" or 9-1-1 telephone outages). Listening to a NOAA Weather Radio station requires a special radio receiver or scanner capable of receiving at least one of seven specific channels within the frequency range of 162.400 MHz through 162.550 MHz, collectively known as the "Weather Band". For example, a receiver that only tunes in standard FM or AM broadcast stations will not suffice. Many cable television systems and some commercial television stations will, during EAS activation, rebroadcast the audio of a warning message first heard on their local NWR station, to alert viewers of a severe weather event or civil emergency, usually with the issuance of a tornado warning or tornado emergency, especially in tornado-prone areas of the country. Updates are typically recorded once per hour, and are broadcast at 5 or 10, and at 15 minutes past the hour. A complete detail of current weather conditions (current sky condition, temperature, dew point, humidity, wind speed/direction and barometric pressure) for the main reporting station in the station's city of license. 01:00–12:00 Area climate summary is played in 15-minute intervals each program cycle. 05:00–07:00 Regional Weather Synopsis updated at least once during this period. 07:00 Hazardous weather outlook and call for action for NWS-trained SKYWARN volunteer weather spotters (if warranted). 07:00 Regional climate summary is recorded sometime between 18:00 the previous night and 07:00 each day. 12:00 Hazardous weather outlook and call for action for NWS-trained SKYWARN volunteer weather spotters (if warranted). 13:00–15:00 3- to 5-day extended forecast, updated twice a day during this period. 16:00–22:00 Regional Weather Synopsis updated at least once during this period. 17:00–21:00 Area climate summary is played in 15-minute intervals during specific days of the week. NOAA Weather Radio station WXL40's programming. Hazardous Weather Outlook for Harrisburg, Pennsylvania and vicinity. The product also includes a tropical update. NOAA Weather Radio All Hazards has a multi-tier concept for forecasting or alerting the public to all types of weather. Actual forecasts vary by the area that the transmitter serves. During severe weather situations, Watch Information Statements for government-designated jurisdictions served by the local NWR station are typically inserted within the station's normal playlist of routine products; a special severe weather playlist temporarily suspends most regularly scheduled routine products in the event National Weather Service-issued warnings (mainly severe thunderstorm, tornado or flash flood warnings) are in effect for the station's broadcast area, which solely incorporate watch, warning and Special Weather Statements, and any active Short-Term Forecasts and Hazardous Weather Outlooks. NOAA Weather Radio is a continuous spoken weather service meaning people can quickly switch on for the latest weather information before switching back to whichever station they are listening to. Hourly Weather Roundup :05/:10/:15 past the hour A one-minute segment detailing the current weather conditions for the station's region (consisting of current sky condition, temperature, dew point, humidity, wind speed/direction and barometric pressure), current observations within 50–75 miles, then current observations within 250 miles of WFO area of responsibility, and finally the main reporting station's current conditions being repeated once again. If no report is available from the main reporting station, the report of the closest observation site will be sustituted. In some locales, if a regularly-reported station has no available report, the message "the report from TSA was not available" will be broadcast. The regional portion may be condensed to a roundup format if the temperatures are within a 5 °F range or if sky conditions are the same or differ limitedly at each given reporting site. Occasionally, due to technical or other problems, the previous hour's observations segment may be included in the product playlist as long as 15 minutes into the next hour, after which it is removed until updated information is available. Hazardous Weather Outlook 7:00 a.m. and 12:00 p.m. (if needed) This segment overviews the information about potential thunderstorm activity (including any areas forecast to be under threat of severe thunderstorms), heavy rain or flooding, winter weather, wildfire, extremes of heat or cold, or other conditions that may pose a hazard or threat to travel, life or property over the next seven days. Occasionally, a NWS WFO may update the Hazardous Weather Outlook while an event is ongoing or if forecast models denote changes from previous forecasts. Depending on the NWS office, it may either state all weather hazards from Day 1–7 or Day 1 separately from Day 2–7. Regional Weather Synopsis/Summary Every 5–6 hours (starting from 3:00 or 5:00 a.m. depending on the station) A report that provides a brief overview of weather events from the previous or current day within the region, followed by an outlook of expected weather from the current time to the next few days. Regional Climate Summary Every 15 minutes (overnights, mornings and evenings) A summary includes information on the minimum and maximum temperatures recorded the previous day; 30-year temperature averages and historical temperature extremes. It also includes wind speed data, sky cover data, historical humidity extremes, humidity averages, the day's recorded weather conditions and heating with(out) cooling degree day data. Depending on the areas, the sunrise and sunset times for the next two days are stated within the summary or as a separate report. Some stations broadcast this first report as early as 1:00 a.m. and the last report as late as 12:00 p.m. Regional Forecast 4:00 a.m. and 3:30 p.m. (more if needed) A report that provides the forecasts for the next seven days for all the counties across the station's coverage area. In case the time for the updates on another segment has not come yet, this forecast will typically be broadcast on a looped format. Short Term Forecast Randomized times A localized, event-driven report used to provide the public with detailed weather information during significant or rapidly changing weather conditions during the next 3–6 hours. This forecast will often mention the position of precipitation as detected by radar. In most areas, this forecast product is not included during routine programming, but will be included when severe weather threatens the listening area. Special Weather Statement A regional event-driven report using to provide the public with details of the upcoming significant weather event, such as a major winter storm, a heat wave, or potential flooding. A significant weather advisory may be issued within a Special Weather Statement, often if thunderstorm activity whether severe or not is occurring in, or approaching an area. Record Information Announcement A segment providing newly set records for coldest/warmest maximum or minimum temperature and maximum precipitation. Zone Forecast Depending on the office A text forecast for local beaches issued by coastal stations, including coastal hazard information such as that pertaining to rip currents. In more coastal offices, this forecast is scheduled to play every cycle, compared to every half hour in more inland offices. River Forecast If needed This forecast is only broadcast if there is a potential for flooding or it is occurring, which would then be included with the hazardous weather outlook. Daily river forecasts are issued by the 13 river forecast centers using hydrologic models based on variables such as rainfall, soil characteristics and precipitation forecasts. Some forecasts, especially those in mountainous regions, also provide seasonal snow pack and peak flow forecasts. A separate forecast, River and Small Stream Observations, is broadcast in areas in and outside the 13 river forecast centers and is only broadcast following a significant hydrological event featuring information on crests, and present and forecasted flood stages. Lake Forecast A forecast that is issued by most stations in the Great Lakes region to explicitly state expected weather conditions within the marine forecast area through the next five days. The report addresses expected wave heights and small-craft advisories currently in effect. Coastal Waters Forecast A forecast stating expected weather conditions and wave heights within the marine forecast area through the next five days. Tropical Weather Summary Every three hours (only if needed) An event-driven report provides an information summary on any active tropical cyclones. Activity summaries for the Atlantic Basin are typically included with stations located in states near the Gulf of Mexico, Caribbean Sea and Atlantic Ocean, while stations along the West Coast receive summaries concerning the Pacific Ocean. Depending on the station and associated Weather Forecast Office, listeners can hear this report every half hour. Professional-grade receivers, typically rack-mounted, for use by broadcast radio and television stations and public agencies who are responsible for acting on or retransmitting weather and emergency alert broadcast. Base-station consumer radios powered by commercial AC power (often with a battery backup). Hand-held battery powered radios, suitable for use by hikers, boaters, and in emergency preparedness kits. Sony ICF-36 portable radio, with Weather Radio reception capability. A BayGen Freeplay clockwork radio. Hand-crank portable radios that do not require AC or battery power, especially designed for use in emergency preparedness kits. Weather radio receivers integrated as an auxiliary function into other devices, such as GMRS radios, portable televisions, FM radios, etc. Radio receiver modules, such as the Silicon Labs Si4707, designed for electronics experimenters and project builders have in the past been available. Historically, it was not uncommon to sell portable radios that featured AM, FM, and TV audio (VHF channels 2–13), with the weather band included some distance down the dial from TV channel 7 (after the U.S. digital TV conversion, these types of radios became mostly obsolete). One of the early consumer weather alert radios (model KH6TY) was designed and manufactured by Howard (Skip) Teller, who was issued a patent on the alerting mechanism and was instrumental in the design of the PSK31 Digipan software and hardware, and the Amateur radio NBEMS emergency communications system. Since April 2004, radio models marketed as "Public Alert-certified" must include these features and meet certain performance criteria, as specified in electronics industry standard CEA-2009. The United States, Canada, Mexico, and Bermuda operate their government weather radio stations on the same marine VHF radio band, using FM transmitters. National Weather Radio transmitters operate VHF-FM between 5–1000 watts. The original "Weather" frequency was 162.550 MHz, with 163.275 MHz recommended as a backup. However, this frequency was dropped due to interference problems with other federal agencies. The official NOAA WX labeling scheme combines the Morse code procedure sign for weather reports (WX) with 1 or 2 digits. The number does not increase in frequency order because the weather channels were created gradually over the years. 162.55 MHz was at first the only frequency (so was thus WX1), then 162.4 (WX2) and 162.475 (WX3) were added later to prevent RF interference from multiple transmitters in nearby areas providing separate reports. The others mainly came into use in the 1990s in less-populated rural, areas and as fill-in broadcast translators relaying an existing station or sending a separate, more localized broadcast into remote or mountainous areas, or those areas with reception trouble. As with conventional broadcast television and radio signals, it may be possible to receive more than one of the seven weather channels at a given location, dependent on factors such as the location, transmitter power, range and designated coverage area of each station. The NWS suggests that users determine which frequency (as opposed to channel) is intended for their specific location so that they are assured of receiving correct and timely information. Example NOAA weather radio coverage for Eastern Michigan. All seven NWR channels are available on stand-alone weather radio receivers that are currently sold online and in retail stores (available for prices ranging from US$20 and up), as well as on most marine VHF radio transceivers, amateur radios and digital scanners. In addition, more mainstream consumer electronics, such as clock radios, portable multi-band receivers and two-way radios (such as FRS, GMRS and CB radio), now feature the ability to also receive NWR channels. Many of the aforementioned devices also incorporate automatic alerting capabilities. Many American television stations offer discounted pricing for radios to viewers as a public courtesy (especially in highly tornado-prone areas), where they are often marketed as an essential safety device on par with a smoke alarm for home fires. According to NOAA, reliable signal reception typically extends in about a 40-mile radius from a full-power (1000 W) transmitter, assuming level terrain. However, signal blockages can occur, especially in mountainous areas. As of 2016, there are over a thousand NWR transmitters across the United States, covering 95% of the population. Because each transmitter can cover several counties, typically a person will program their weather radio to receive only the alerts for their county or nearby surrounding counties where weather systems are most likely to move in from. Audio from a NOAA Weather Radio broadcast of a tornado warning issued for Greensburg, Kansas on May 4, 2007. Weather Radio stations will carry alerts when dangerous weather threatens a location within their listening area. Whenever a weather or civil emergency alert is issued for any part of a NWR station's coverage area, many radios with an alert feature will sound an alarm or turn on upon detection of a 1,050 Hz attention tone (help·info) that sounds just before the voice portion of an alert message. The specification calls for the NWS transmitter to sound the alert tone for ten seconds and for the receiver to react to it within five seconds. This system simply triggers the alarm or turns on the radio of every muted receiver within reception range of that NWR station (in other words, any receiver located anywhere within the transmitter's broadcast area). Generally, receivers with this functionality are either older or basic models. When an alert is transmitted, the SAME header/data signal (help·info) is broadcast first (heard as three repeated audio "bursts"), followed by the 1,050 Hz attention tone, then the voice message, then the end-of-message (EOM) data signal (repeated quickly three times). This encoding/decoding technology has the advantage of avoiding "false alarms" triggered by the 1,050 Hz tone itself in locations outside the intended warning area. Broadcast areas are generally divided into SAME locations by county or marine zone using the standard U.S. Government FIPS county codes. NOAA's SAME alert protocol was later adopted and put into use by the Emergency Alert System (EAS) in 1997 the replacement for the earlier Emergency Broadcast System (EBS) and even earlier CONELRAD now required by the FCC for broadcast stations. Environment Canada eventually integrated SAME alerting capability into its Weatheradio Canada network in 2004. Organizations are able to disseminate and coordinate emergency alerts and warning messages through NOAA Weather Radio and other public systems by means of the Integrated Public Alert and Warning System. In September 2008, Walgreens announced that it would utilize SAME technology to deliver local weather alerts via a system of LED billboards located outside its drugstore locations to provide an additional avenue of weather information. Many national billboard companies (such as Outfront Media, Clear Channel Outdoor and Lamar, among others) also use their color LED billboard networks to display weather warnings to drivers, while state-owned freeway notification boards, which utilize the EAS/NOAA infrastructure for AMBER Alerts, also display weather warnings. The weekly alert system test, usually conducted between 10:00 a.m. and noon local time every Wednesday, as heard on Milwaukee's KEC60 on November 24, 2010. Every local National Weather Service weather forecast office conducts a scheduled weekly test of the NOAA Weather Radio public alert system, generally every Wednesday between 10:00 a.m. and 12:00 p.m. (noon). Some NOAA Weather Radio stations broadcast tests of the Emergency Alert System on predetermined days and times. This is the National Weather Service office in [city]. The preceding signal was a test of the NOAA Weather Radio warning alarm system on station [call sign of radio station] in [location]. During potential or actual dangerous weather situations, specially built receivers are automatically activated by this signal to warn of the impending hazard. Tests of this signal and receivers' performance are usually conducted by this National Weather Service office on Wednesdays at [time of day]. When there is a threat of severe weather, or existing severe weather is in the area on Wednesday, the test will be postponed until the next available good-weather day. Reception of this broadcast, and especially the warning alarm signal, will vary at any given location. The variability, normally more noticeable at greater distances from the transmitter, will occur even though you are using a good quality receiver in perfect working order. To provide the most consistent warning service possible, the warning alarm will be activated only for selected watches and warnings affecting the following counties: [list of counties]. This concludes the test of the warning alarm system on NOAA Weather Radio station (call sign). We now return to normal programming." From the introduction of NOAA Weather Radio until the late 1990s, nearly all the voices heard in the broadcasts were those of the staff at local National Weather Service (NWS) offices. The messages were manually recorded, first on tape cartridges and later digitally, and then placed in the broadcast cycle. As the NWS added more transmitters to provide broader radio coverage, the staff had difficulty keeping broadcast cycles updated in a timely fashion, especially during major severe weather outbreaks. In 2002, the National Weather Service contracted with Siemens Information and Communication and SpeechWorks to introduce improved, more natural voices. The Voice Improvement Plan (VIP) was implemented, involving a separate computer processor linked into CRS that fed digitized sound files to the broadcast suite. The improvements involved one male voice ("Craig"), and one female voice ("Donna"). Additional upgrades in 2003 improved "Donna" and introduced an improved male voice nicknamed "Tom", which had variable intonation based on the urgency of the report. As part of this upgrade a Spanish voice, "Javier", was added at a few sites. Due to the superior quality of the "Tom" voice, most NWS offices used it for the majority of broadcasts and announcements. In 2016, the NWS replaced almost all of the CRS systems in operation at its Weather Forecast Offices—which had been in use for over 20 years and were approaching the end of the system's expected service life—with the Broadcast Message Handler (BMH). The new system is more closely integrated with the AWIPS software and intended to be more reliable. The BMH units replaced "Donna" and "Tom" with an improved "Paul" voice (its classification from new voice partner NeoSpeech). Many stations have dubbed him "Paul II" or "Paul Jr" to avoid confusion with CRS "Perfect Paul". For the NWS offices that incorporate Spanish programming into the NWR broadcast cycle, VIP "Javier" was replaced with a much improved female voice named "Violetta" (another voice from NeoSpeech). The upgrade initially began at six offices: Greenville-Spartanburg, South Carolina; Brownsville, Texas; Omaha, Nebraska; Portland, Oregon; Anchorage, Alaska; and Tiyan, Guam. Many of the stations saw an initial negative reaction primarily due to many mispronunciations. Most local NWS Offices provide a method of reporting these problems, and have the ability to reprogram the voices accordingly. Human voices are still heard on occasion, but sparingly, mainly during station identifications, public forecasts, National Marine Fisheries Service messages, public information statements, public service announcements, required weekly tests, and severe weather events. The capability exists for a meteorologist to broadcast live on any transmitter if computer problems occur or added emphasis is desired, or to notify listeners who are concerned about a silent station on another frequency whether that station is dark due to technical errors, prolonged power outage, or a weather event has forced it off the air. Many areas will broadcast a secondary report in Spanish during severe events or warnings. There are few known transmitters dedicated to Spanish weather information, however they are due to change. Four forecast offices broadcast weather information entirely in Spanish on a separate station from the English broadcasts: San Diego (WNG712 in Coachella/Riverside), El Paso (WNG652), Miami (WZ2531 in Hialeah, since 2012), and Brownsville (WZ2541 in Pharr and WZ2542 in Harlingen, since 2014) These stations originally used a male Spanish synthesized voice named "Javier" for all broadcasts but have since been upgraded with the BMH voice "Violetta". The Albuquerque Weather Forecast Office often repeats weather alerts in Spanish after their initial dissemination in English. WXJ69 in San Juan, Puerto Rico broadcasts all information, including forecasts, in the same manner. Several websites provide internet audio streaming of a subset of the NOAA Weather radio stations, but the most prominent of these, the Wunderadio section of weather information website Weather Underground, discontinued live streams of NWR broadcasts in April 2017. In February 2017, as Weather Underground prepared to discontinue its Wunderadio subpage, a group of individuals formed the site noaaweatherradio.org to allow former Wunderadio users and others to listen to NWR audio feeds. A large majority of the feeds featured on the Weather Underground's Wunderadio page were incorporated onto the new site. Various NOAA Weather Radio station streams are also available at broadcastify.com and weatherusa.net/radio. Wikimedia Commons has media related to NOAA Weather Radio. ^ a b c d e "The History of NOAA Weather Radio". Weather Radios Direct. Retrieved 13 May 2014. ^ a b "History of NOAA Weather Radio". National Oceanic and Atmospheric Administration (NOAA). ^ a b Nelson, W.C. (2002). "American Warning Dissemination and NOAA Weather Radio". ^ a b c d e "NOAA Weather Radio All Hazards Console Replacement System FAQs". National Weather Service. Archived from the original on 2016-12-30. ^ a b "Voice Improvement Processor". National Oceanic and Atmospheric Administration (NOAA). ^ Kupec, R. J. (July–August 2008). "Tuning in: Weather radios for those most at risk". Journal of Emergency Management. 6 (4). ^ Teller, Howard. "Latching detector circuit US 4158148 A". Retrieved 5 July 2015. ^ "Howard Teller". Retrieved 5 July 2015. ^ "A Panoramic Transceiving System for PSK31" (PDF). Retrieved 5 July 2015. ^ "NATIONAL WEATHER SERVICE MARINE PRODUCTS VIA NOAA WEATHER RADIO". ^ "USCG: U.S. VHF CHANNELS". ^ "NATIONAL WEATHER SERVICE MARINE PRODUCTS VIA NOAA WEATHER RADIO". www.nws.noaa.gov. ^ "U.S. VHF Channel Information". navcen.uscg.gov. ^ "NOAA Weather Radio – County Coverage by State". nws.noaa.gov. National Oceanic and Atmospheric Administration. Retrieved January 12, 2015. ^ Service, US Department of Commerce, NOAA, National Weather. "NOAA Weather Radio – SHHH". www.nws.noaa.gov. Retrieved 2017-09-06. ^ "NOAA Weather Radio – Using NWR SAME". National Oceanic and Atmospheric Administration. Retrieved January 12, 2016. ^ "Weatheradio Network" – The Green Lane (Backgrounder), 7 January 2004. Environment Canada "Media Room" archives. ^ "Walgreens Electronic Outdoor Signs Now Deliver Vital Weather Messages at More Than 3,000 Corner Locations Across America". Walgreens. Archived from the original on September 27, 2008. ^ "NOAA Weather Radio Alarm Test Procedures". National Weather Service. National Oceanic and Atmospheric Administration. ^ a b c d Service, US Department of Commerce, NOAA, National Weather. "NOAA Weather Radio – NWR Voices". www.nws.noaa.gov. Retrieved 2017-09-04. ^ Service, US Department of Commerce, NOAA, National Weather. "New NOAA Weather Radio Management Platform is Coming Soon". www.weather.gov. Retrieved 2017-09-04. 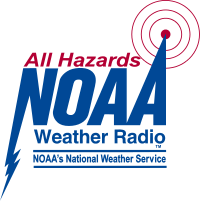 ^ "New All Hazards NOAA Weather Radio Now Operational". National Weather Service Office, Sullivan, Wisconsin (Milwaukee area). 24 May 2016. Retrieved 1 June 2016. ^ Huttner, Paul (15 June 2016). "NOAA Weather Radio has a new voice, and his name is Paul". Minnesota Public Radio. Retrieved 18 June 2016. ^ Service, US Department of Commerce, NOAA, National Weather. "A New Voice for NOAA Weather Radio". www.weather.gov. Retrieved 2017-09-04. ^ "WU feature and product updates – Customer Feedback for Weather Underground". help.wunderground.com. Retrieved 2017-09-21.